3-year old England resident Noah McLean Glass was barred from taking part in a Disney Princess makeover at Disneyland Paris. Young Noah is a huge fan of Disney, but mainly all of the princesses and his family has brought him from England to Paris multiple times so he could see all of his favorite characters in real-life. When his mother, Hayley McLean Glass, learned about a Disney Princess makeover at the Paris theme park, she instantly thought that would be an amazing early Christmas present for Noah, who at the age of three can already recite Frozen's "Let it Go," word for word. Mclean Glass said, "I knew that there would be NOTHING he'd love more than to get to wear a pretty dress, put make up on like Mummy does and have his photo taken being one of his beloved Disney Princesses." But apparently, boys aren't allowed to participate in the princess activities as McLean Glass points out on her her blog. According to Noah's mother, when she inquired about the details for the Disney Princess makeover, she received an email form Disneyland Paris saying that it was not possible to have a boy participate in the event. The letter reads. "Thank you for your interest in Disneyland Paris. At this time it is not possible to book Princess for a Day for a boy"
Instead, the McLean Glass family were offered an expensive "tailored gift pack," which was just an added insult. The family were furious and Hayley McLean Glass decided to write about the experience on her blog, which then gained worldwide attention. Disneyland Paris quickly took action after news outlets started to pick up the story and have since apologized. 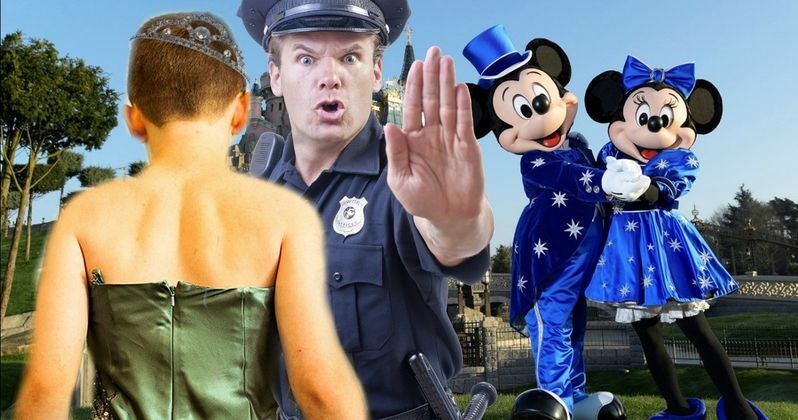 People Magazine reached out and received this response from the French Disneyland spokespeople, "This experience is available to all children ages 3-12 and we've reached out to the family to apologize for them being provided with inaccurate information." The theme park went on to issue a similar statement to Noah and his family. They claim that what happened was an "isolated incident" and that it's not "reflective of any policy or belief held here at Disneyland Paris." In addition, Disneyland Paris went on to say that they are big proponents of diversity and that decision of the cast member does not reflect on Disney's beliefs. They explain. "The cast member's response is not reflective of any policy or belief held here at Disneyland Paris... Diversity is near and dear to our hearts and we want to make sure that all our guests enjoy their experience at our resort. Of course, both boys and girls are welcome to enjoy the Princess for a Day experience in addition to all our other special activities. We are going to ensure this does not happen again." Mclean Glass wrote in her blog how devastating the whole experience was to her and the family. She then asked what would happen had the tables been turned. She had this to say. "The way I look at it, if a little girl went to Disneyland and wanted to do a pirate experience or a 'Spider-Man' experience, there would be no way that they would stop a girl from doing that because there would be an uproar. So why is it different for a boy?" The McLean Glass family has yet to reveal if Noah will be going back to his favorite place on the planet to take part in the Princess for a Day makeover, but hopefully Disney offered the family some free tickets this time around instead of trying to upsell them on some crappy package delivered like a slap to the face last time. That's only if the McLean Glass family decide to go back to Paris Disneyland. But boys can now go dress like and act like a princess at Disneyland Paris. Spread the word.